Commemorations in Aylesham to remember those lost in war and in mining made a stirring start at the weekend with the dedication of two new memorials. 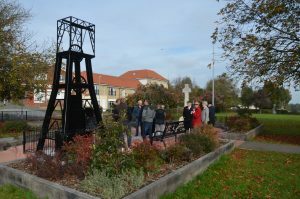 On Saturday, a near four metre high scaled down replica of the former Snowdown Colliery winding wheel was winched into place, before an admiring crowd, in a fenced area forming part of the village remembrance garden in Market Place. 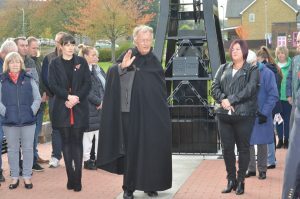 On Sunday, the recently completed memorial cross and stone, which stands directly opposite the Miners’ Memorial, was dedicated by Father Geoffrey, priest in charge of St Finbarr’s Church, in a short ceremony. He blessed the Miners’ Memorial at the same time. Dozens of residents attended the occasion including several ex -services personnel including Lauren Forster, who was in the Army for six years and saw active service in Afghanistan during that time, earning a medal and a Mention In Dispatches. She gave a reading of the Remembrance Day verse from the poem For The Fallen. 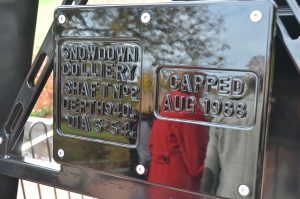 The exact design of the Miners’ Memorial had been a well kept secret by Aylesham Parish Council and only a few people knew what it looked like until its delivery on Saturday from the engineering company in Denton and its subsequent unveiling. Parish Council Chairman Jo Cartledge said afterwards: “The memorial garden is a fitting focal point for our village and I hope people will take the chance to pause there and reflect on the sacrifices made by those we have lost over the past century or so. The entire memorial garden has cost around £54,000 with contributions of £8,000 each from Barratt Homes, Persimmon Homes, Gallagher and Dover District Council. The parish council funded the remaining amount. 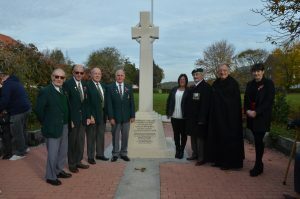 The stone cross and plinth of the war memorial were made by Alan Middlemiss and William Hirst of Cantuari at Adisham with the engraving by Neil Scrivener of Aylesham. The Miners’ Memorial structure was fabricated by All Things Metal of Denton after parish council vice chairman Mark Townsend came up with the original idea which was then developed to 3D model stage by local business Sharpak for design approval. 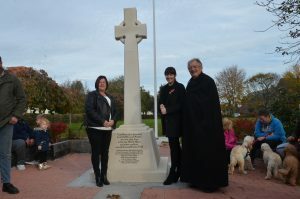 Earlier this year the parish council invited residents to submit a form of words to be inscribed on the base of the war memorial. The one chosen was written by Jo Cartledge, Barbara Morgan and Josephine Cousens.